October 8 - American lighter company Zippo today removed an image from its Facebook page in which it took the credit for helping reignite the Olympic Flame for Sochi 2014 after it accidentally went out shortly after its arrival in Russia. They took down the picture after Sochi 2014 officials warned that the company, based in Bradford in Pennsylvania, may be breaching strict rules on companies linking themselves to the Olympics unless they are official sponsors. 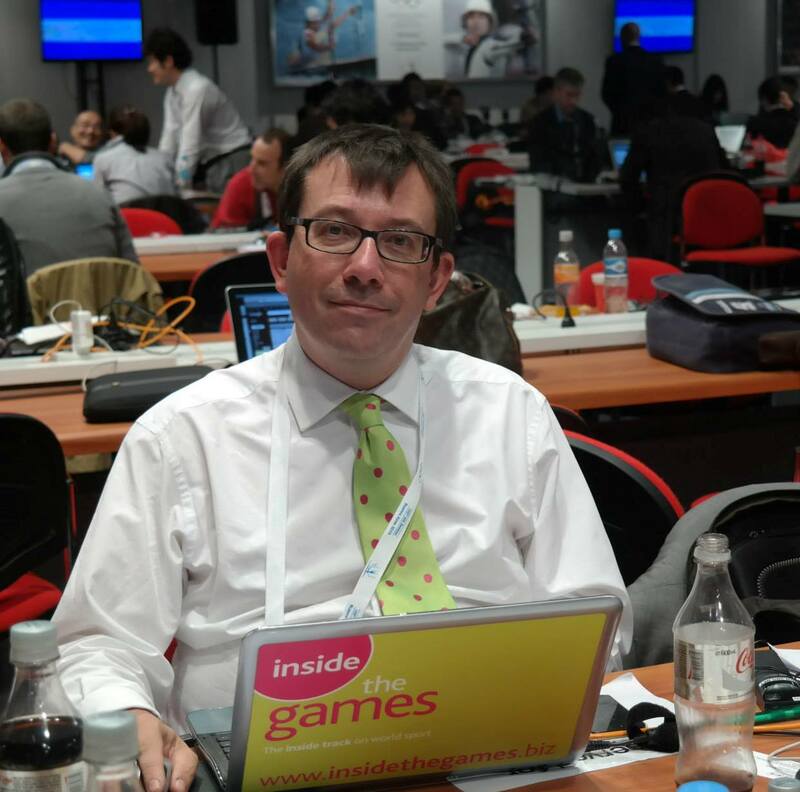 "It was never meant to imply that somehow we had any relationship or sponsorship with the Olympic Committee at all," David Warfel, global marketing director for the company, told Russian news agency RIA Novosti. The campaign had been launched after the Olympic Torch, being carried by former swimmer Shavarsh Karapetyan, went out while he was running through the Kremlin on Sunday (October 6). A police officer in plain clothes then relit the Torch with a lighter that the company claimed was manufactured by Zippo. As well as the campaign on Facebook, Zippo also started one on micro-blogging site Twitter with the hashtag #ZippoSavesOlympics, which was brought to the attention of Dmitry Chernyshenko, President and chief executive of Sochi 2014, who said on his Russian account that they "working on it". 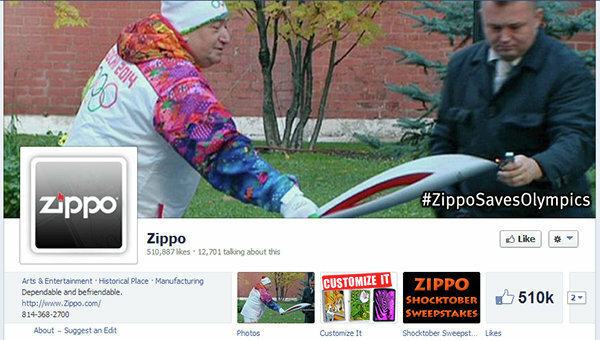 Zippo dropped the campaign after Sochi 2014 officials contacted them through the company's Moscow office. 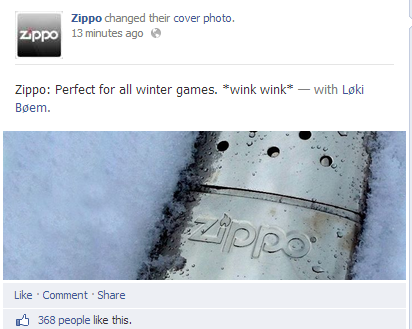 Instead they replaced the picture on their cover page with a new image of one of its lighters buried in the snow and with a new tagline: "Zippo: Perfect for all winter games. *wink. wink*"
Zippo's campaign adds to the embarrassment of Sochi 2014 officials who should have relit the Olympic Torch using one one of the back-up Flames they have brought with them from Greece. The Torch has gone out at least twice since Sunday's incident and Sochi 2014 officials have used relit it in the correct manner. But it is the one relit using the lighter that is set to be the most remembered. "It was a little bit of whimsy on our part," Warfel told RIA Novosti. "We never intended it to be a promotion or marketing event."